Steve Callahan's fastball was called blazing. That fastball helped his Lewis-Clark American Legion team be called state champions, according to The Spokane Spokesman-Review. Callahan took a no-hitter into the sixth inning of this August 1985 Idaho State American Legion Baseball Tournament. Lewis-Clark ended up winning by a score of 11-4, The Spokesman-Review wrote. Four years later Callahan would take that fastball to the pros. He couldn't take it to a long career. He played four seasons as a pro. He never made AA. 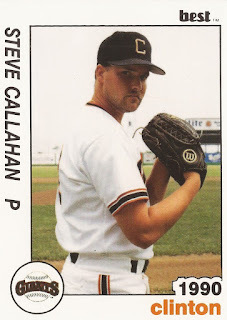 Callahan's pro career began in 1989, taken by the Giants in the 17th round of the draft out of Lewis-Clark State College in Idaho. At Lewis-Clark State, Callahan made second-team NAIA All-American in 1988. That June, helped his team to another NAIA title, Callahan named series MVP. With the Giants, Callahan started at short-season Everett. In 26 relief outings, he picked up six wins, six saves and a 2.25 ERA. He moved to single-A Clinton in 1990. In 41 outings there, he had a 2.25 ERA. He got another 41 outings at high-A San Jose in 1991 and he had an even-better ERA of 2.09. Callahan stayed in the California League for 1992, but switched to the Athletics system and high-A Modesto. He picked up nine wins in 49 outings, saving seven games. He ended with a 3.53 ERA. It was his final season as a pro.